With Thanksgiving and Christmas just around the corner, the last thing you need is a major plumbing problem to occur. When your faucet starts dripping uncontrollably or the kitchen sink becomes clogged, it can feel like the whole world is falling down around you. Don’t let this happen to you. Instead, call a professional plumber to remedy the issue. While you may feel like you can tackle a major plumbing problem on your own, without the proper tools and experience, there’s a good chance you’ll just end up making matters worse. If you come across any of the plumbing issues below, contact your local plumbing company right away. For professional plumbing repair services in Phoenix, call the experts at Robins Plumbing today. Have you ever stepped in the shower, hoping for a warm and luxurious experience, only to feel a waterfall of cold water pouring down on you? This is often due to an issue with your home’s water heater. Water heater problems and defects can come from a handful of issues, and depending on whether your water heater runs on gas or electricity, the repair methods may be significantly different. It’s always best to call a plumbing company when you experience a lack of hot water in your home, rather than trying to fix the issue yourself. We’ve all heard the dreaded stories about pipes bursting in the winter, but how exactly does this happen? When you live somewhere with a cold winter climate, this tragedy can occur when water is left in your pipes. The main reason pipes burst is because the water in them freezes, and expands, causing the pipes to eventually crack and break. When your pipes crack, they’ll start to leak once the outside temperature rises, which can result in some major flooding issues in your home. Burst pipes are a serious matter, which is why we always recommend calling a plumbing repair company to assess and fix the problem. A licensed plumber will be able to pinpoint the main source of your leak, while also recommending the best repair solution for your home. When your bathtub takes two hours to fill up with water or you’re shower head isn’t giving you the strong spray it used to, there’s likely something wrong with your home’s water pressure. One of the biggest causes of low water pressure is faulty fixtures. If the shower heads or faucets in your home are outdated, they can easily become clogged by things like rust, limestone, and dirt. Not only does this impede the flow of water coming out of your fixture, it even reduces the quality of your water. Another reason you may be experiencing low water pressure may have to do with your home’s water valves. Most homes have two water valves that control the flow of water into the house. The first water valve can be found on your water meter, which is usually situated alongside your house or near the street. The second water valve is in your home. If either one of these valves becomes faulty, it can lead to low water pressure. If the water valves in your home and water meter are fully open, you may have some clogged pipes on your hands. To help you determine if this is the case, we recommend calling your local plumbing company to come and inspect the problem. If you’re a Phoenix homeowner, there’s a good chance you’ve dealt with blocked pipes before. This is a common issue for those who have sewer lines, and these clogs are often caused by things like sediment buildup, tree roots, and items that shouldn’t be flushed down the toilet. While you may be tempted to use things like rodding machines and chemicals to remedy your clogged pipes, if done incorrectly, this can damage your sewer line, resulting in thousands of dollars in damages. Are you thinking about replacing that outdated sink in the kitchen with something more modern and sleek? Do you want to install a state-of-the-art hot tub in your backyard that you can enjoy all year round? If you’re considering adding some new appliances or fixtures to your home that require water, it’s always best to call a professional plumber. Attempting to relocate large items, like dishwashers and refrigerators, can be a major hassle on your own, and often requires moving supply lines and drains. 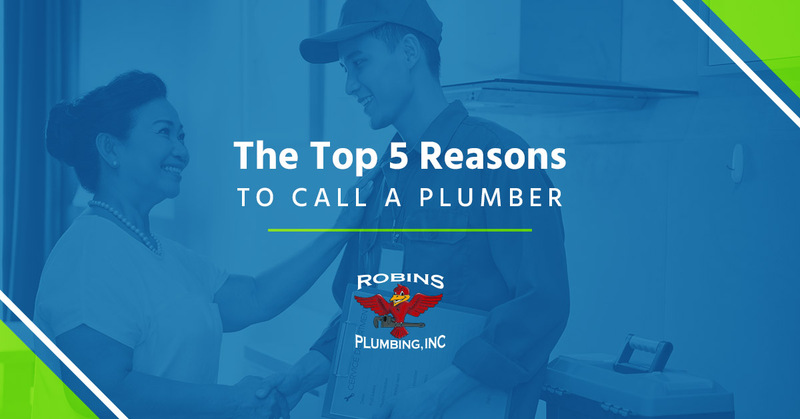 When you need professional plumbing services near Phoenix, you can trust Robins Plumbing Inc., Inc. to provide you with professional and prompt service. We have years of experience working with residential and commercial plumbing systems, and we have the skills and experience to get the job done right. Contact us today to learn more!